For family, work and personal reasons, I going to have to end blogging. My thanks to all of the editors for putting up with me and giving me this forum, and my thanks to all of the readers as well. I wish you all well. If the Americans hadn't come, they would have killed us. They took our land. You cannot find one Hazara (ph) who is a supporter of Taliban or Gulbuddin." -- CSRT of Faiz Ullah, ISN 919. Ullah's CSRT found him to be an enemy combatant . Q: Were your hands tied the whole time? Q: Were the guards with you all of the time? A: The Detainee states the guards were with him all the time. They didn't just give him to the driver and tell the driver to take him. There were 2 Taliban in the car with the Detainee. A: The Detainee states yes, they were armed." -- CSRT of Dawd Gul, ISN 530. I cannot find an ARB or habeas petition for Gul, but according to the Washington Post's list of Guantanamo detainees, he has not been released. "Senator Susan Collins , a Maine Republican who is considered a moderate, said she would not support Specter's amendment. 'Detainees from Guantanamo have clogged our courts with more than 420 lawsuits challenging everything from their access to the Internet to the quality of their recreation facilities, her office said in a statement that called the lawsuits 'an abuse of our court system.' " -- Farah Stockman, "Legal Residents' Rights Curbed in Detainee Bill," Boston Globe, September 28, 2006. I am writing this letter to you and I hope you are in the best of health. I was born in Saudi Arabia in the region of Taif and lived there. However I was imprisoned for three years because of a criminal case and after three years I was exiled from Saudi Arabia to Afghanistan. When I reached Afghanistan, we were captured by the members of Al-Qaeda. We were accused that we have been sent by the Saudi government to assassinate Osama Bin Laden. After interrogation I was handed over to the Taliban and I was put under the intelligence in Qandahar for a period of one and a half year. After one and a half year, they moved me to the Qandahar political prison and I stayed there for three and a half years. After the government of Taliban fell, and the government of Hamid Karzai took over, they handed me over to the Americans. Now, I have been under the control of the Americans for the past three years and eight months. Six months ago, I was told by the Americans that I am innocent and I am not an enemy combatant. I have one problem. For the past 8 years I have no information about my family. My family lives in Saudi Arabia in the region of Taif. I would like to request you some humanitarian help to contact my family at telephone number [redacted]...and bring me their welfare. I hereby thank you sincerely and please accept my regards: Sadeeq Ahamd Turkistani"
--Letter to counsel from Sadiq Ahmad Turkistani, filed before the D.C. District Court on December 30, 2005. Turkistani is one of six Guantanamo prisoners captured in a Taliban prison in Kandahar in December 2001. He later told his lawyers that "Al Qaeda operatives tortured him for over 20 straight days" until he falsely confessed to trying to assassinate Bin Laden "in the hope and belief that they would kill him." In large part because of his habeas corpus case, Saddiq Ahmad Turkistani was transferred from Guantanamo to Saudi Arabia in June of this year. Three of the other prisoners captured with him in the Taliban prison, however, were classified as enemy combatants by their CSRTs and remain in Guantanamo. "In November 2002, a newly minted CIA case officer in charge of a secret prison just north of Kabul allegedly ordered guards to strip naked an uncooperative young Afghan detainee, chain him to the concrete floor and leave him there overnight without blankets, according to four U.S. government officials aware of the case. The Afghan guards -- paid by the CIA and working under CIA supervision in an abandoned warehouse code-named the Salt Pit -- dragged their captive around on the concrete floor, bruising and scraping his skin, before putting him in his cell, two of the officials said. After a quick autopsy by a CIA medic -- "hypothermia" was listed as the cause of death -- the guards buried the Afghan, who was in his twenties, in an unmarked, unacknowledged cemetery used by Afghan forces, officials said. The captive's family has never been notified; his remains have never been returned for burial." -- Dana Priest, "CIA Avoids Scrutiny of Detainee Treatment," Washington Post, March 3, 2005. I find it at once sad and ironic that Tuesday, as the House prepared to pass HR 6166, Iva Toguri breathed her last. Ms. Toguri is better known as 'Tokyo Rose,' the sobriquet given to various English-speaking Japanese women who broadcast popular music laced with appeals for Allied personnel to surrender to the might of the Japanese Empire. Yet Ms. Toguri never actually made any of those broadcasts, was not Japanese (except by ancestry), and was in fact a loyal U.S. citizen who found herself trapped in an enemy nation on December 7, 1941. I'll admit that I'm not yet as depressed as Jim Henley, whose post about HR 6166 is enough to give me nightmares, but it is rather difficult to really accept just where we've come over the past six years. As Ms. Toguri's ordeal illustrates (and if you didn't read the link, you should), the U.S. has made plenty of mistakes in the past, and I don't think we should give up all hope that we can fix this too. But it's hard not to be discouraged by the complete failure of our elected representatives and our polity to deal with this problem more effectively. Reasoned political discourse has been replaced by demagoguery and parliamentary legerdemain, and it's unlikely to get any better in the near future. For me personally this is an unfortunate confluence of events as well. Eighteen years ago I joined the United States military because I believed that I owed some small debt to the country that bore me; while I have been aware of my country's flaws for many years, I always believed that we could overcome those flaws. Yesterday I completed my packet to request my reinstatement on active duty, because I am painfully aware of the Army's need for good officers (and even mediocre ones). It's hard not to wonder if the country I want to defend is the one I may actually defend. It's hard not to wonder if I'm doing the right thing at times. "The Year of the Police"
Every day, the stream of anti-Bush administration sentiments flows incessantly, with commentary ranging from mild rebuke to paranoid unmedicated DU-sized hyperbole. The hard part sometimes is separating the wheat (legitimate concerns about how things are going) from the chaff (politicized grandstanding and raging cases of BDS). But in this article, it looks like we have a case where we did drop the ball in Iraq. As just about every survey of Iraqis will attest, security is the number one problem in Iraq right now, and it has been a major concern since the end of major combat operations. One significant way to solve the security problem is better police protection, and the way to do that is to train more police officers, and the way to do that is to build the infrastructure that can accommodate more and better training. And therein lies the problem. A $75 million project to build the largest police academy in Iraq has been so grossly mismanaged that the campus now poses health risks to recruits and might need to be partially demolished, federal investigators have found. The Baghdad Police College, hailed as crucial to U.S. efforts aimed at preparing Iraqis to take control of the country's security, was so poorly constructed that feces and urine rained from the ceilings in student barracks. Floors heaved inches off the ground and cracked apart. Water dripped so profusely in one room that it was dubbed "the rain forest." The report serves as the latest indictment of Parsons Corp., an American construction giant that was awarded about $1 billion for reconstruction projects across Iraq. After chronicling previous Parsons failures to properly build health clinics, prisons and hospitals, Bowen said he now plans to audit every Parsons project. Emphasis mine. There's no excuse for this. Because Parsons couldn't build a proper police training campus, they are directly responsible (in my opinion) for endangering the lives of both Iraqis and the American soldiers assigned to protect Iraq from jihadists and Sunni and Shia paramilitants. The way I see it, if this report is true, the mismanagment by Parsons Corp. is un-American and should be criminal. We should audit every Parsons project, and we should investigate how Parsons came to be selected in the first place and how they were awarded contracts totaling ten digits. Federal investigators who visited the academy last week expressed concerns about the buildings' structural integrity. "They may have to demolish everything they built," said Robert DeShurley, a senior engineer with the inspector general. Accounts like these make it hard not to violate the posting rules. Egads. Having wallowed in despair over the detainee bill, I have decided to do something constructive, namely: inflict more misery on you, my gentle readers. -- I was looking at the Cook Political Report's new rankings of the most competitive Senate races, and to my horror and amazement, my own race, which I don't think of as all that competitive, was ranked ahead of the Virginia Senate race, which pits James Webb against the awful George Allen. 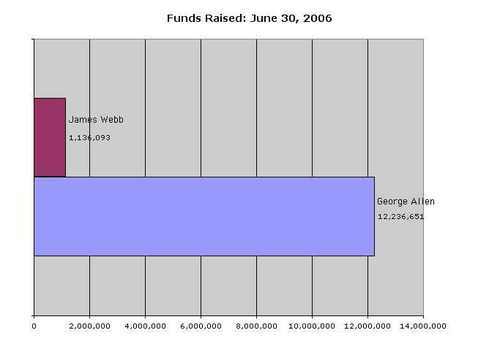 If Webb wins, several wonderful things happen. First, there's one more Democrat in the Senate. Second, there's one more Democrat who is capable and confident about national security. Third, George Allen loses, and macaques everywhere breathe a sigh of relief. But here's the most important thing: George Allen's chances of ever successfully running for President become really, really remote. This matters. We've already had an incompetent faux Cowboy with a streak of cruelty as President for eight years. I'm not sure we can withstand another. Allen's chances of becoming President have already been damaged, but losing his Senate race would drive a well-deserved hemlock stake through their heart. See what I mean about misery?That's an eleven million dollar fundraising advantage. And we can't have that, can we? Of course not. So here's the link: donate. If you require actual reasons, read on. "President ... 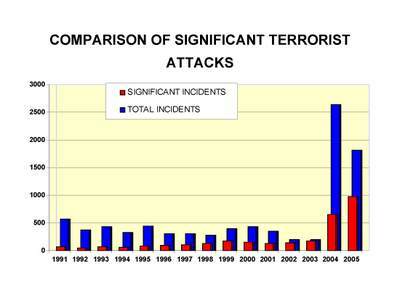 Denies War Has Worsened Terrorism"
"A "Significant" terrorist incident is one in which a person was killed, wounded or kidnapped (or there was property damage in excess of $10,000)."